Now in its 23rd year, the Annual Awards Luncheon is the high point in the IWF calendar. In 2018, we welcomed Iowa native and National Public Radio political reporter, Danielle Kurtzleben. Danielle specializes in economics and politics, particularly as they relate to gender. 2019 celebrates the IWF’s 25th Anniversary. Please join us in this special anniversary year as we take a look back at our Founders and the mission they created for us, with a focused vision for the future and the next 25 years. This year’s Luncheon takes place October 3, 2019 at the Coralville Marriott and Hotel. 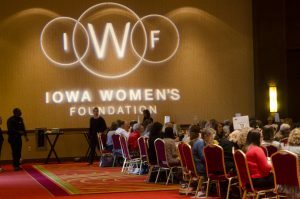 IWF will announce its grantee partners for 2020, share news of the year with supporters, and raise critical funds to support IWF’s mission of improving the lives of Iowa’s women and girls. Photos from past Luncheons are found at the links below.